A Germany-based Egyptian author has requested protection from Egyptian authorities after ultra-conservative Islamists in Egypt declared him an "apostate" and launched an online campaign calling for his death. 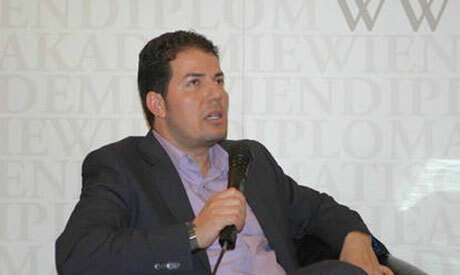 Hamed Abdel-Samad, a researcher in political and Islamic studies, was invited by Egypt's so-called 'Secularist Movement' to speak at a 4 June forum devoted to "Islamic fascism." Abdel-Samad's speech, however, appears to have put him in hot water – and may even have put his life in jeopardy. At the forum, Abdel-Samad asserted that "Islamic fascism" could trace its origins to "the return of the Muslims to Mecca [some 1500 years ago], when they... destroyed all the pagan idols." Before this, he added, "they had accepted religious pluralism in Medina... At this time, they had said, 'You have your religion and we have ours'." In response to the assertions, Assem Abdel-Maged, a leading member of Egypt's ultra-conservative Al-Jamaa Al-Islamiya, and Mahmoud Shabaan, Arabic rhetoric professor at Al-Azhar University (known for his strong stance against secularism), declared Abdel-Samad an "apostate." On Egypt's religious Hafez television channel, Shabaan accused Abdel-Samad of having been an "apostate" even before his recent statements. "He has been flagrantly questioning Islam and thinks it is a bad religion, a fascist religion... His punishment should be death," Shabaan declared. "Even if he repents for what he said, he must be killed," Shabaan added. "His repentance might help him with God [in the afterlife], but he must be killed." Speaking to Al-Ahram's Arabic-language news website, Abdel-Samad – the author of several books deemed blasphemous by conservative Islamists – called on Egypt's prosecutor-general to provide him with protection. Abdel-Samad said the campaign against him constituted "proof" that the administration of Islamist President Mohamed Morsi was "trying to impose itself and its judgments on the community in the name of God and away from the judiciary and police." He elaborated: "What is happening now in Egypt amounts to a cultural invasion and ideological terrorism." Islamic hardliners in Egypt have justified the killing of several public figures in recent decades, the most famous of whom was the late Nobel Prize-winning author Naguib Mahfouz. The celebrated writer survived an attempt on his life after being accused of blasphemy by conservative Islamist critics due to his depiction of God as a human leader in one of his novels. Abdel-Samad, for his part, stressed that he did not intend to insult Islam with his comments. "My views may be right or wrong, but I have the right to express them," he said. "I was surprised when my friends sent me the video showing them calling for my death." Several Islamist activists also revealed Abdel-Samad's address in Egypt online through a photo-shopped picture showing the latter with the phrase "Wanted: Dead" emblazoned on his forehead. "Mahmoud Shabaan gave the right to any Muslim to kill me," he said. "And I have since received a torrent of insults and threats from Islamist youth via Facebook and Twitter." "It's really ironic that a university professor [Shabaan] and an ex-terrorist [Abdel-Maged] are trying to exonerate Islam from charges of being fascist by doing something fascist – namely, killing someone for simply voicing an idea." Abdel-Maged, like other Al-Jamaa Al-Islamiya figures, was sentenced to prison in the past after being convicted of carrying out deadly attacks. In an interview with Germany's Spiegel Online, Egypt-born Abdel-Samad – the son of a Muslim preacher – admitted to "criticising many things about Islam." He stressed, however, that the religion itself "must not be demonised." Islam, he said in the same interview, "is like a drug... a small dose can be very healing and inspiring. But when the believer approaches every life situation based on dogmatic teachings, this is dangerous." Abdel-Samad said that his dream was for an "enlightened" Islam, "without sharia or jihad, without gender apartheid." He also admitted to not praying regularly or fasting during the month of Ramadan. "I'm not a believer in this sense," he declared in 2010. "But I feel as a Muslim. This is my culture." Giordano-Bruno-Stiftung, a German non-profit foundation that aims to "support humanism" and upon whose advisory board Abdel-Samad sits, has called on German politicians – including German Chancellor Angela Merkel – to pressure President Morsi to take action against what it calls the "campaign to kill" Abdel-Samad, who also holds German nationality. I could have swarn I left a comment. Either that or censorship is alive and well. ---"He has been flagrantly questioning Islam and thinks it is a bad religion, a fascist religion... His punishment should be death," Shabaan declared.--- In other words "How dare he say islam is bad and fascist, lets make him pay by doing something bad and fascist! that'll show people that islam isn't bad and fascist!" Your comment shows best that Hamed is 100 % right in his critizism!